When the iPad was launched there was an instant reaction that these new tablets would work especially well with lean-back media, such as films, TV and magazines, maybe not so well with lean-forward media where we create and mix, customise and navigate. The idea of lean-forward and lean-back media may have started with Jakob Nielsen, who back in 2008 explained that the web is an active medium and users are engaged and want to go places and get things done (lean-forward), and with TV viewers want to be entertained and they dont want to make choices (lean-back). The early critics mis-read the iPad which has become much more of a lean-forward device than we would have thought possible — back in the days when there were very few apps for the platform it seemed more like a viewer than a maker. There are now masses of brilliant creative apps for the iPad. Games (very lean-forward) have been the most commercially successful of the app categories and we see that even apparently lean-back media, such as TV and newspapers and magazines are increasingly aiming to become lean-forward applications on the iPad. Magazines in the iTunes newsstand are in general much more ‘lean forward’ than magazines in the Google Play newsstand, where outbound links and even content search is not supported. We have seen some surprising lean-forward moves from lean-back media, not just with magazines, e.g. the growing interest in TV on the iPad. If Apple launches its rumoured iTV product, you can bet that its going to be a lot more ‘lean-forward’, much more interactive than the typical cable TV channel. Yet even cable TV is becoming more lean-forwrd than it used to be. Twitter’s recent launch of its Amplify advertising project is a step in the same direction. The aim being to use the interactivity of the social network that feeds off the TV channels to integrate and syndicate appropriate ads to the global audience. Twitter’s chief scientist even suggests that Twitter may “become the soundtrack to television” — as though TV did not already have a soundtrack! There is no question that media that works on the iPad works better if the device is not simply a platform for consumption, but a launchpad for engagement and exploration also. So magazines are also getting up off the couch and going with their readers in directions which engage and explore. 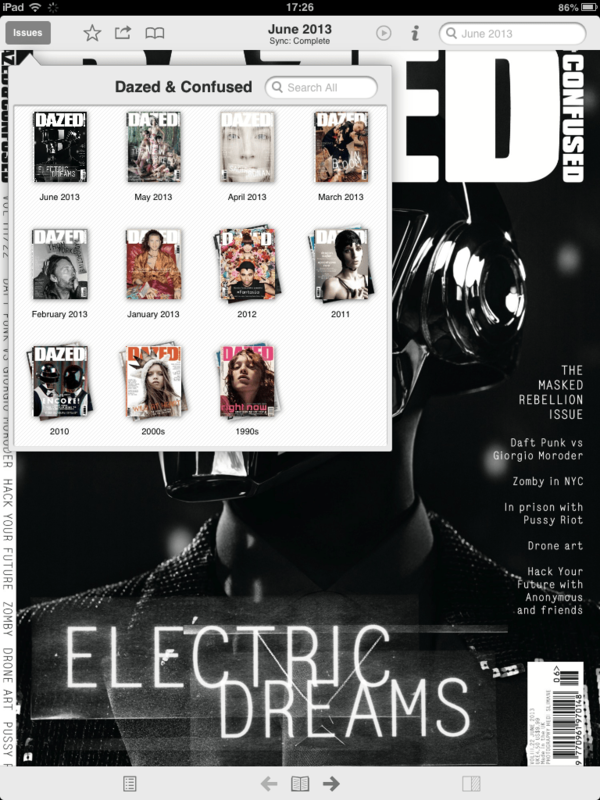 Exact Editions is now delivering version 7 software for all the magazine apps on the platform. These bring a new interface, enhanced searching and additional focus on the social engagement potential of magazine apps. The new Dazed & Confused app is a great showcase for these lean-forward possibilities. Search is now particularly powerful because the user can search through the whole magazine, the complete archive or selected years or decades, to find particularly relevant articles, designers or fabrics (“black chiffon dress”, “Stella McCartney”, “mullet”), and the power feature is that if the user bookmarks the search, all the search result pages are synced to the device (up to 200 will be found in one search, if the limit is reached eg for “Vivienne Westwood” switch to searching by decade). When magazine apps provide so much scope for searching and sharing they are much more lean-forward and much less lean-back. The most ‘lean-forward’ aspect of magazine publishing is that subscribers look forward to getting their next issue. Enabling those subscribers to feel and search the depth of the magazine, and to share snippets of the great content with friends and fellow enthusiasts is the best way in which digital magazines can deliver a new audience and build a new community around the magazine brand.